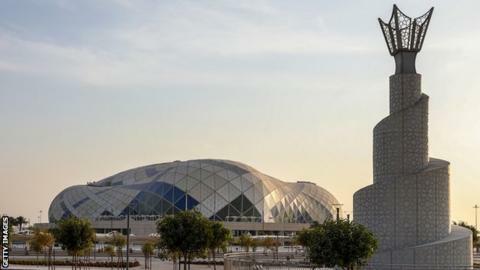 Football's world governing body Fifa has been urged to conduct an "independent investigation" into claims the Qatar 2022 World Cup bid team ran a secret campaign in 2010 to sabotage competing host bids. The chairman of the Digital, Culture, Media and Sport select committee Damian Collins said the "serious allegations", published in the Sunday Times, would be a breach of Fifa's rules if true. "It requires a proper independent investigation and Fifa should make clear that will happen," he said. Speaking on BBC Radio 5 live, he added: "If the Qataris have broken the rules, they should face some sanctions." The paper claims to have seen leaked documents that show the Qatari bid team employed a US PR firm and ex-CIA agents to smear its rivals – mainly the United States and Australia. The alleged aim was to create propaganda to give the impression that a World Cup would not be supported domestically. The Qatar tournament organisers deny the allegations. A campaign such as that alleged by the Sunday Times would have broken Fifa's bidding rules. Qatar beat rival bids from the United States, Australia, South Korea and Japan to the right to host the 2022 World Cup. Fifa's rules say World Cup bidders should not make "any written or oral statements of any kind, whether adverse or otherwise, about the bids or candidatures of any other member association". The Qatar bid team has been previously accused of corruption, but was cleared following a two-year Fifa inquiry. A respected academic was paid $9,000 (£6,870) to write a negative report on the huge economic cost of an American World Cup, which was then distributed to news media around the world. Journalists, bloggers and high-profile figures were recruited in each country to hype up negative aspects of their respective bids. A group of American physical education teachers were recruited to ask their US Congressmen to oppose a US World Cup on the grounds that the money would be better used on high school sports. Grassroots protests were organised at rugby games in Australia opposing the country's bid. Intelligence reports were compiled on individuals involved in rival bids. The documents seen by the Sunday Times – which the paper says were leaked by a whistleblower who worked on the 2022 bid team – were apparently unavailable during the Fifa inquiry. The Qatar bid team is alleged to have employed the New York office of communications company Brown Lloyd Jones, which is now BLJ Worldwide, along with a team of former intelligence officers to run a campaign aimed at undermining one of Fifa's key criteria in the bidding process – that each bid should have strong backing at home. In a statement Qatar's Supreme Committee for Delivery and Legacy said it "rejects each and every allegation put forward by the Sunday Times". "We have been thoroughly investigated and have been forthcoming with all information related to our bid, including the official investigation led by US attorney Michael Garcia," it said. "We have strictly adhered to all Fifa's rules and regulations for the 2018/2022 World Cup bidding process." A Fifa statement said "a thorough investigation was conducted by Michael Garcia and his conclusions are available in the report", referring to the completed two-year inquiry. BLJ Worldwide did not respond to a request for comment from The Sunday Times. Qatar won the right to stage the tournament in December 2010. Russia was awarded the 2018 World Cup at the same time, beating three other bids, including England's. Once again, Qatar's hosting of the 2022 World Cup is mired in controversy. Ever since its shock win in the race to stage the event eight years ago, the country has faced questions over how it triumphed, its winter scheduling, and the human cost of building the infrastructure required. So what will these latest allegations mean? On the one hand, we do not yet know the explanations of those named in the documents obtained by the Sunday Times. The allegations relate to events several years ago, and some will point out that Qatar's is hardly the first bid suspected of using private intelligence and covert tactics. Indeed it has been claimed England's 2018 bid spied on its rivals. Crucially, Qatar was cleared of corruption by Fifa's two-year long investigation, headed up by American lawyer Michael Garcia. However, there is bound to be speculation that if this is found to be a breach of the rules, linked directly to the bid team, and that Garcia was not aware of this new information, then it could increase the risk of Qatar being sensationally stripped of the event. With the tournament now just four years away and tens of billions of pounds already spent on preparations, that remains unlikely. Fifa would be worried about the threat of being sued if it took such action. However, its new leadership has vowed to regain trust after the years of scandal, so perhaps it will feel it has no choice but to launch a fresh investigation. Qatar is embroiled in a diplomatic dispute with some of its neighbours, which perhaps explains the timing of this leak. And with Fifa president Gianni Infantino known to be keen on a 48-team 2022 World Cup, this could lead to fresh pressure being applied on Qatar to agree, and to share their tournament with other countries in the region. But less than two weeks after Fifa hailed Russia's World Cup, it has not taken long for the governing body – and its next host – to face yet more scrutiny.